Many people think about learning the alphabet, counting and recognizing shapes when envisioning early childhood education. While those are all very important for children to learn, music and dance can be helpful as well. Incorporating music and movement into early childhood education can help young children with development, social interaction and language growth. Early childhood education, for children 8 years of age and younger, is the beginning of a student's academic experience. This is an important time of learning and brain development for children in preparation for the rest of their education. Playing music and moving to a beat provides stimulating experiences for young children and fosters learning at home or in the classroom. 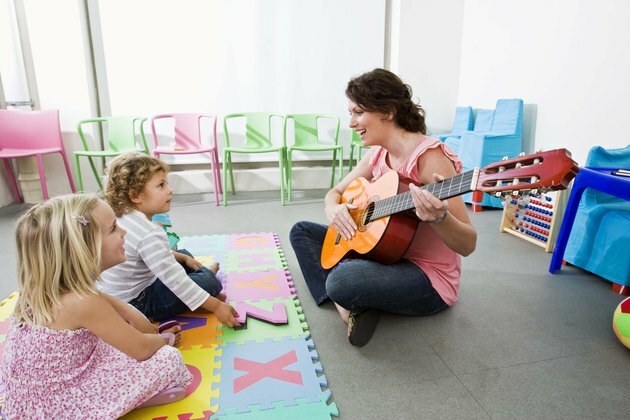 Parents and early childhood teachers can incorporate music and movement into daily routines. According to the Early Childhood Music and Movement Association, 85 percent of brain development occurs by the time a child reaches 3 years. As children grow, they need to learn specific activities that are important for development. For example, very young children begin to scoot and crawl for movement and while these activities are part of eventually learning to walk, they are also essential for brain development. Additionally, patterned activities at home or in the preschool classroom, such as clapping to music or jumping in time to a beat stimulate brain function and help the brain to organize thoughts and behaviors. Language has its own tempo; speaking a language fluently involves regular pauses, stops and starts in appropriate places. For example, most people do not speak in a constant, running diatribe of words; rather they insert pauses between phrases, they use accents and they increase or decrease the overall speed of speech. Music has a tempo and teaching young children songs that have rhythms and beats or learning to march in time to a tune can help students to learn the rhythm of speaking and improve their communication skills. Several different types of music and movement activities can be incorporated into early childhood education. Teaching songs, such as the "ABCs" or "If You're Happy and You Know It" while clapping or tapping along can teach rhythm and cadence while learning new words. Songs that involve action and hand gestures that follow the music teach children not only the meaning of some new words, but also to move and sing at the same time. Other types of activities for use in the classroom could be dancing with streamers or scarves, playing small musical instruments, singing songs in rounds, singing while cleaning up, marching to the beat or imitating animals. Not only can this be beneficial academically, it also keeps children moving, which is good for their little bodies.